"At no time since the war - not even during the occupation of the Ruhr - it is said, has there been so much militarist and nationalist propaganda in Germany as there is now." 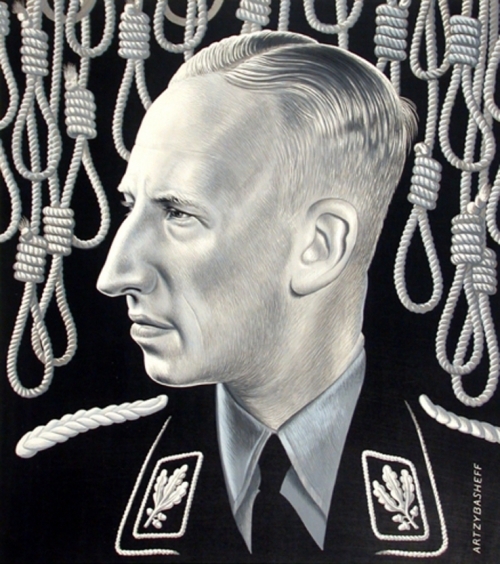 "Anti-militarist newspapers, it appears, are afraid, in Berlin at least, to raise their voice in protest because of the continual and ruinous suspensions by the authorities..."
"The idea took root in the fertile brain of Minister of Propaganda, Dr. Joseph Goebbels, also known as the 'Limping Devil'...'Heroes are both born and trained', is the Nazi slogan. The future leaders are taken under the government's wings at the age of ten.'" -and over a period of about twelve years they would have been dragged around from one Harry Potter-style-castle to another being schooled in Nazi dogma and all other assorted Nordic pagan weirdness and then, after having jumped through a number of additional Teutonic hoops, they would be posted in top government positions. A fascinating look into the queer thinking of the Nazi hierarchy. Attached is a profile of Hitler's director of the NSDAP (National Socialist German Workers' Party), and their political differences that led to his resignation. "Hitler was hard hit when Gregor Strasser (1892 � 1934), one of his ablest and oldest supporters, broke away from him. It happened in one of the fights between rival factions in the Hitlerite movement which followed losses sustained in the November Reichstag elections." "Profound gratitude is due Strasser from Hitler because when Hitler was released from jail, there was at least a nucleus of his party left, so that its reconstruction did not have to begin in a void. Gratitude was expressed on Hitler's part for he made Strasser chief of his propaganda work." He was murdered in his prison cell during the Night of Long Knives (June 30, 1934). "Behind the scenes that hard day at Berchtesgaden, revealing what Hitler said to Kurt Schuschnigg and what the Austrian public never knew about the German plot to stage in Vienna a counterpart of the Reichstag fire, as a pretext for invasion. Schuschnigg spoiled that pretext, only to furnish another one himself. Uncovering the plot in the hope of averting invasion he merely brought it on." "But today there is no laughter in Germany. There are only smiles of disdain, contempt, conceit and strain. There is no humility, no pity, not much mercy. There is an odd sort of honor, an amazing egotism. But there is no will power nor need there be in a nation that knows but one man's will." Written by a fellow who in later years would write a good deal about propaganda films, this article is amusing for the way it reported the total lack of humor and curiosity that Nazi Propaganda Minister Joseph Goebbels (1897 � 1945) brought to the subject of film production; how they totally killed the existing German film industry and made film criticism illegal.